Moore County’s newly-constituted Board of Commissioner seem no more inclined than the previous board to raise property tax rates. When the Commissioners opened their annual planning retreat on Monday, January 5 with a discussion of their personal goals for the year, the common thread was keeping property taxes at current levels. All Moore County property will be revalued for tax purposes this year, and a key question is whether the total value of real estate in the county — the tax base — will rise, fall, or stay the same. Whatever happens to the overall tax base, the commissioners appear determined to minimize the impact on individual taxpayers. “My number one goal is, in our tax revaluation, that Moore County taxpayers will not see any increase whatsoever in what they are going to pay,” Chairman Nick Picerno said. County Manager Wayne Vest “and the staff have done an excellent job in controlling costs while providing service to our citizens and getting good value for our tax dollars,” he added. “With Wayne’s leadership, the staff has done a great job of keeping spending under wraps, Commissioner Randy Saunders said. 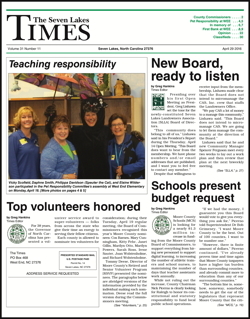 While supporting the idea of a "concept" high school designed to provide graduating high school seniors with marketable career skills, some members of the Board of Education appear anxious to nail down exactly what skills should be included in the new school's course offerings — and to make sure the course offerings reflect the needs of Moore County employers. Members of the MCS administrative staff presented the results of a web-based survey that solicited public opinion about the new school during the January 5 meeting. Over ten days, the poll attracted responses from 1,069 citizens, including 518 students and 350 parents. Associate Superintendent Kathy Kennedy said 59 percent of the responses came from the area served by Pinecrest High School, 30 percent from the Union Pines area, and 11 percent from North Moore. Board member Charles Lambert urged that staff make an extra effort to alert North Moore residents to opportunities for input, since many residents in that area do not regularly peruse media based in Southern Moore County. Survey respondents were presented with a list of potential course offerings, grouped within four "academies," which included Life & Health Sciences, Agriculture, Design & Production, and Hospitality & Culinary Arts. Most proposed course offerings received at least some votes. Among the most popular were Animal Science (including Veterinary Assisting), Culinary Arts, Hospitality Management, Horticulture (including Golf Course & Turf Management), and Life & Health Science (including Physical Therapy, Anesthesiologist, & Nursing). There results "tell us we were on the right track as far as the pathways were concerned," Kennedy said. Associate Superintendent Eric Porter told the Board that community forums aimed at gathering additional information are planned for February 12 at North Moore, February 16 at Union Pines, and February 23 at Pinecrest. They will be held from 6:00 pm to 7:30 pm. Read more: What's the Goal of the Concept High School? Seven Lakes Country Club has a new owner -- almost. The club informed members on Wednesday, November 12, via email that the Board of Directors has identified a new owner for the club. But negotiations are apparently still underway, so details are scarce. An email sent to members Wednesday morning, November 12, broke the news, but provided few details. "The BOD wishes to inform the membership that a decision has been made on who will be the new owner of SLCC. Due to the sensitive nature of negotiations we cannot reveal their name at this time. We will inform you once the negotiations are complete. The BOD is very excited for the future of Seven Lakes Country Club under the new owner." "Member dues and annual payment options will remain the same. Information regarding this will be available within the week." The Board had listed the award-winning course, designed by Peter Tufts, with Hilda Allen Real Estate Inc. in Adel, Georgia. The broker then conducted a sealed bid auction with a November 6 deadline. In the case of the pasture fence in Seven Lakes North, the factor that separates the Architectural Review Board [ARB] from the Recreation Committee is beauty — beauty, and its constant companion, money. Members of both those Seven Lakes Landowners Association [SLLA] committees, along with representatives of the Security and the Facilities Committees, as well as a smattering of interested residents, met on Friday afternoon, November 7, to review options for replacing the existing pasture fence. SLLA President Bob Racine called the special meeting after discussion of the matter was postponed at the October 29 Open Meeting. Jane Leach presented the ARB committee's recommendations; George Temple spoke for the Recreation Committee. They key issue that separates those proposals is a wood fence along Seven Lakes Drive: ARB wants wood; Recreation can live without it. No one apparently sees much value in retaining the existing split rail fence. Community Manager Ray Sohl said many of the fence posts are loose and moving, causing rails to fall. "I don't see a reason to keep it, because it will constantly require maintenance," Sohl said. For the second time this year, Seven Lakes Landowners Association [SLLA] Director Bill Hirsch has resigned. Responding to comments made by former SLLA President Bob Darr during the public forum period of the Wednesday, October 29 Open Meeting, a visibly angry Hirsch raised his voice, insulted Darr, and then stormed out of the room. Darr’s remarks focused on proposed upgrades to the fence that surrounds the Association’s horse pasture. But Hirsch's anger apparently had less to do with Darr's comments regarding the fence and more to do with a series of emails and conversations regarding an October 23 Architectural Review Board [ARB] meeting that dealt, in part, with the stables, and from which Darr believed he had been excluded. Earlier in the month, during the Monday, October 13 SLLA Board Work Session, the Recreation Committee and the Stable Manager proposed fence improvements that aimed to make the pasture more secure. Horses have escaped through the fence on at least two occasions in the past sixty days. Stable Manager Amanda Dugan reported, during the Work Session, that the current split rail fence and electric wire were old and in a constant state of disrepair. She recommended the construction of a new electric fence inside the existing split rail fence. After Duggan's presentation, Hirsch recommended that any fence rehabilitation first be approved by ARB, suggesting that there would be enough time to finalize the fence proposal between the Work Session and the October Open Meeting. During their October 23 meeting, ARB voted against the concept of a secondary fence around the perimeter of the stable, effectively ruling out the stable manager's recommendation. The “concept” high school on Moore County Schools’ [MCS] Master Facilities Plan has caught the im-agination of the local business community. “If we can pull this off, we open up a new day for our kids, in terms of their competence and competitiveness — and our ability to attract companies because we have the talent here,” Partners in Progress CEO Pat Corso told the Moore County Board of Commissioner in a recent meeting. But the concept high school is also the least well-defined project on the Board of Education’s ten-year facilities wish list. Associate Superintendents Dr. Kathy Kennedy and Dr. Eric Porter, along with Career and Technical Educational Specialist Amy Garner, presented the rough draft of a proposal for the school that would divide it into four separate, career-focused academies: life and health sciences; agriculture; design and production; and hospitality and culinary arts. The design aims to give students the training they need to graduate from high school with marketable skills — or credits that can be transferred to a community college or four-year university. A close partnership with Sandhills Community College — and community colleges in surrounding counties — is an integral part of the plan. Providing high school graduates with marketable skills was a key objective that surfaced in conversations with local business leaders, as well as conversations with parents led by former superintendent, Dr. Aaron Spence, Kennedy said. Though no location has been chosen for the new school, the idea of placing it on the SCC campus has been much talked about in public discussions of the idea. Where to put the concept high school? There are two key questions that need to be answered about the proposed 800-student "concept" high school on Moore County Schools' Master Facilities Plan. The first question is what to teach there. You can read about that discussion on Page 7 of the October 17 Seven Lakes Times or here. The second question is where to put the school. Ever since the idea of a concept high school first saw the light of day in Moore County, the assumption among many, if not most, of its advocates has been that the new school would be conveniently located next to the campus of Sandhills Community College — quite likely built on land currently owned by the college. But that idea has some folks wondering why the new school — which is supposed to be a driving force for economic development — would be built on the opposite end of the county from Robbins and North Moore — the part of the county that most desperately needs economic development. Why place the school that houses the district's technical career training facility so far away from those students most likely to seek vocational training rather than college admission? Read more: Where to put the concept high school? It was little more than a decade ago that the two boards found themselves in a funding dispute so acrimonious that the school board sued the commissioners. It has taken many years for that chill to thaw. What brought the two boards together on October 14 was the need to build and expand school facilities — to relieve overcrowding in high schools and elementary schools, to replace aging buildings, and to develop a new magnet high school that would offer students job training or a head start on their college career. The standard playbook for building new schools has the school board developing a master facilities plan encompassing ten years and $50 $75, or $100 million in projects; voters approving the sale of school bonds; and commissioners figuring out how to pay back the principal and interest on all that borrowed money. The Moore County Animal Shelter is asking for help locating a dog that scaled the shelter fence to escape — and may be headed home to Seven Lakes West. On Sunday morning, Alma, a six to seven year old Australian Shepherd Mix, climbed over a fence topped with barbed wire, and then climbed over the gate at entrance to the shelter parking lot. Volunteers and staff ran after her down the driveway to NC Highway 15/501, and then searched for her, to no avail. Alma was turned over to the shelter when her owner, a resident of Seven Lakes West, died. The shelter staff report that she was despondent and clearly grieving for the loss of her owner. Because her home was in Seven Lakes West, Animal Center staff believe she could be headed back in the direction of Seven Lakes. If you find a dog fitting Alma's description, contact The Animal Center at 910-947-2858. They were hoping to place her with a foster family. The annual public hearing on Moore County's budget is seldom a pleasant experience, for either the folks speaking or the commissioners listening. Funding for public schools is generally the focus — which is not surprising, given that funding for education makes up forty-two percent of the county's general fund budget. It's not uncommon for speakers to insinuate — when they don't come right out and say it — that the Moore County Board of Commissioners are underfunding education and playing fast and loose with the future of Moore County's children. But, this year, it was different. The dozen speakers who took turns at the microphone during the Tuesday, June 3 hearing on County Manager Wayne Vest's proposed FY2015 budget spent as much time thanking the commissioners for their continued support of the schools — and their recent advocacy for school funding in Raleigh — as they did pressing the case for additional school funding.